Each summer, Anne Sponholtz heads to Cedar Key for a weeklong vacation on the Gulf Coast of north Florida. The tiny village has its share of ghost stories and pirate tales, and Jimmy Buffett once sang nostalgically about it. But it wasn't until she made a midwinter visit to the quiet island community that Anne understood what it is about Cedar Key that keeps bringing her back. An egret wades in the shallow water in front of a condo at Cedar Key. The key is known for its variety of water birds, and the egret is often joined by pelicans and seagulls when schools of fish pass by or anglers clean their catch. 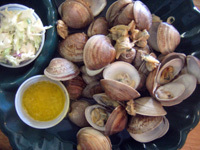 A plate full of fresh Cedar Key clams, drawn butter and coleslaw served up at Robinson Seafood Restaurant, helps set the mood for a visit to the tiny island known for its clam industry. The best time to find sand dollars at Sand Dollar Beach in Cedar Key is at low tide, but beware of the muck and oyster beds. 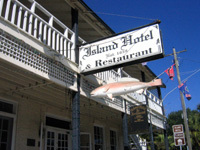 The historic Island Hotel in Cedar Key is a place filled with stories -- some even of the ghostly kind -- while its restaurant is known for fine dining. Many of the restaurants and pubs do not just overlook the water but are actually over the water. They draw especially large crowds during the town's Celebration of the Arts in April and the popular Seafood Festival in October. Colorful shops with unusual architectural designs, like the Cedar Keyhole, are common sights that make up the Cedar Key landscape. Every road tripper knows the adrenalin rush that comes from taking off for points unknown. But sometimes what beckons is the warm and cozy feeling of a familiar road trip, especially when the destination is one of those rare places that, for reasons often hard to explain, keeps calling you to return. That's how it was for me in February. Cedar Key was calling. I pulled out the GPS -- I never leave home without it these days -- and entered "Cedar Key, Florida." I knew where it was, of course. I'd been visiting the tiny island village on the Gulf Coast of north Florida every summer for four years. But I wondered how the GPS would get me there. It plotted the usual route: State Road 21 to Melrose, then west on State Road 26 to Gainesville, left onto U.S. 441 South for a short way, then State Road 24 for 112 miles to Cedar Key. "Two hours to Cedar Key," I told my husband confidently, and we headed out. But the familiar road trip quickly turned unexpected, as an extensive detour caused us to change directions, sending the GPS into "Recalculating!" mode. It meant we wouldn't be stopping at Brown's Farm in Orange Heights after all -- no strawberry shortcake and jam on this trip. Passing the University of Florida in Gainesville, we stayed on State Road 24, which terminates in Cedar Key. Once reaching the town of Otter Creek, the scenery gets more native. You're more likely to spot a deer on the side of the road -- or a wild hog running through the woods -- than a dog barking behind a fence. "They cut the brush back some so you can see them better, but you still gotta look out for the deer," a Cedar Key resident warned us. We stopped at the historical marker in Rosewood. The 1923 Rosewood Massacre, a week of killing and arson that stemmed from racial unrest, remained a dark secret for decades until a St. Petersburg Times reporter stumbled across the story in 1982. A piece later aired on "60 Minutes," resulting in the state compensating survivors and descendants of the massacre $2.1 million for the loss of their property. Down the road is Robinson Seafood Market & Restaurant. Behind door No. 1 is the restaurant. My steamed Cedar Key clams were simply delicious. At the seafood market, behind door No. 2, proprietor Carl Robinson can fillet a fish faster than Chef Emeril Lagasse can cut up garlic. We picked up some oysters and clams for a weekend family clambake. Robinson also captains charter-fishing trips. Cedar Key's waters are an angler's delight, and the expansive parking area at the boat ramp was packed with empty boat trailers. 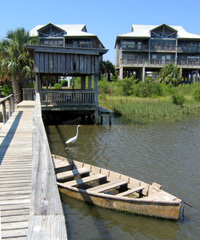 Unlike most communities along Florida's West Coast, Cedar Key is not skirted in white sandy beaches. Instead, the Gulf of Mexico dribbles into the shallow shoreline through a maze of oyster beds, estuaries, channels, islands and sea grass. Horseshoe crabs, sea urchins, sand dollars, hermit crabs and seabirds are common along the water's edge. The town is scattered with tiny gift shops, many reflecting the bohemian lifestyle many of the 900 residents enjoy. "Gone home for lunch and a nap -- be back at 3," said the sign we once found on a shop door. No fast-food restaurants or chain hotels here. A few rental condos have crept into the town over the years, like Old Fenimore Mill, a favorite with families and snowbirds. Condos, like many of the homes, are built on stilts. No high rises; three stories is the limit. We headed to Sand Dollar Beach. A sign asks visitor to "Please Take Only a Few," but the tide was high and there wasn't a sand dollar in sight. Last time I visited, at low tide, I was wearing flip flops -- not the way to venture through the muck revealed at low tide. I got stuck with every step I took. When I sliced my foot open on an oyster bed, blood spewing everywhere, I learned my lesson. Wandering into the 1859 Island Hotel & Restaurant, I cautiously gazed around to see if any ghosts were present. The claim of resident ghosts once drew the television series "Haunted Inns & Mansions" to feature the hotel. To my disappointment, the hostess in the restaurant told us there hadn't been any ghosts reported lately. Still, it's a storied town. Among the hotel's famous guests is Jimmy Buffett, who performed from the hotel balcony and in the Neptune Lounge, which is down the hall on the right. (The song he wrote and performed, "Incommunicado," mentions Cedar Key in the first line.) When a horse-drawn carriage stopped at the hotel, we listened in as the driver told a tale of pirates invading Cedar Key way back when. Locals often gather on the benches scattered along the sidewalk outside the hotel and in front of the artsy shops on Second Street. I couldn't help but get my wallet out at the Cedar Keyhole Gallery, an artists' co-op. Along Dock Street, on the waterfront, many of the restaurants offer a view of passing sailboats, fishing boats and tour boats headed out to nearby barrier islands. Popular gift shops are sandwiched between the restaurants. As we left Cedar Key, we stopped again at Robinson's Restaurant. We had key lime pie and a cup of coffee, and then set off on our trip home. We knew we'd be back another day. 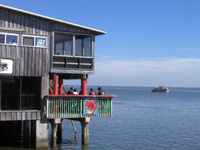 Cedar Key is a place that has endured hardships and redefined itself on more than one occasion. Hurricanes, pirates, disease, the loss of its gillnet fishing industry -- all have taken a toll. But Cedar Key and its people have bounced back time and again. Cedar Key is as much a state of mind as a place. Perhaps that is what keeps calling me back.